We’d love your help. Let us know what’s wrong with this preview of If It Makes You Happy by Claire Kann. To ask other readers questions about If It Makes You Happy, please sign up. 3.5 stars. Having adored LET’S TALK ABOUT LOVE from the same author, I absolutely needed to read this book. But now that I have, it’s hard to believe that the two were written by the same person. For starters, this story is told from the first person POV, whereas Alice’s story was in the third person. That was a very good surprise, because Winnie’s voice is so strong. It was wonderful to be able to hear everything she was thinking directly. I cannot imagine someone claiming Winnie is a one-dimens 3.5 stars. Having adored LET’S TALK ABOUT LOVE from the same author, I absolutely needed to read this book. But now that I have, it’s hard to believe that the two were written by the same person. For starters, this story is told from the first person POV, whereas Alice’s story was in the third person. That was a very good surprise, because Winnie’s voice is so strong. It was wonderful to be able to hear everything she was thinking directly. I cannot imagine someone claiming Winnie is a one-dimensional character, unless they have never met a real girl in their lives! Because Winnie is REAL and BEAUTIFUL. At the same time, this was a much messier book than LET’S TALK ABOUT LOVE. I’m not even technically talking about the story (although that too isn’t 100% clear); I’m talking about Winnie’s thoughts. They are all over the place! Don’t get me wrong, she’s super interesting, relatable and a breath of fresh air, but boy does she love talking and thinking and living life day by day. It feels as though the author did not create a plan before starting to write this. Each chapter is more like a series of thoughts than a series of scenes. But I did enjoy reading about the relationships in this book a lot, even if there is no plot per se. There is stuff happening, such as Winnie winning a competition, but the emphasis is on her interactions with the people in her life (and herself, in her own mind). I especially liked her and her cousin Sam’s dynamics because I believe in creating strong ties with family members, even those that don’t seem to have much in common with us. 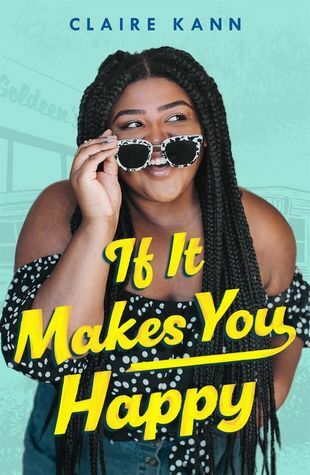 IF IT MAKES YOU HAPPY is not an improvement upon LET’S TALK ABOUT LOVE exactly, because it’s wordy and all over the place at times, showing that organization is important in a story, but it’s a lovely summer read with themes of family, friendship and love. "It’s about a queer Black fat girl in a committed queerplatonic relationship—and falling in romantic love with someone else for the first time." eeeep the author of a favorite book of mine where all kinds of representation is done superbly is writing another book!! Haven't read it yet, but anything Claire Kann writes is going to be super AWESOME!!! And that cover is all kinds of #BlackGirlMagic feels!!! That cover really lives up to the title, and the summary sounds cute and lovely, and I'm so excited for another Claire Kann book. I loved Let's Talk About Love so I'm suepr excited for this! What I Liked: Yay for diversity! Yay for intersectionality! Yay for queer positivity! All of those things are great. Winnie (the MC) has a strong inner monologue. What I Didn't Like: There was pretty much no plot. If you enjoy stories that are character-driven but not much happens, then this is definitely the story for you. If you are looking for a plot to carry the story along, you will be gravely disappointed. This also joins a litany of YA books where the main character is already out of high What I Liked: Yay for diversity! Yay for intersectionality! Yay for queer positivity! All of those things are great. Winnie (the MC) has a strong inner monologue. This also joins a litany of YA books where the main character is already out of high school and thus the book is geared toward older teens / adults rather than younger teens. That's not necessarily a bad thing, per se, but YA books featuring actual teen characters are definitely needed. This read more like a new adult romance novel. This was really cute. I love Winnie's voice! This cover model has stretch marks on her arms!!! I love it. I wanted to love If It Makes You Happy so much. I loved the characters, the world building, and the thematic elements. Kann has lovingly crafted the world and the people of Misty Haven and they are good ones. I enjoyed the body positivity, the diversity, and the queer positivity. Winnie is a great, flawed protagonist. But...the plot wasn't engaging. At best, I was mildly entertained. At worst, I slogged through a few pages before giving up. It's as if the plot couldn't hold up under the weight o I wanted to love If It Makes You Happy so much. I loved the characters, the world building, and the thematic elements. Kann has lovingly crafted the world and the people of Misty Haven and they are good ones. I enjoyed the body positivity, the diversity, and the queer positivity. Winnie is a great, flawed protagonist. But...the plot wasn't engaging. At best, I was mildly entertained. At worst, I slogged through a few pages before giving up. It's as if the plot couldn't hold up under the weight of all the ideas, themes, and characters that Kann wanted to express. Definitely not the book I expected at first! I wanted more of the contest and more of the town but I loved the characters and the honesty of the MC. I’ll buy for my classroom, for sure.